Michael Johnston allegedly undermined and harassed the former manager of the four-star Park Hotel near Rugby Park. 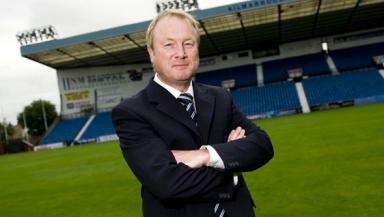 The chairman of Kilmarnock FC has been accused of bullying the manager of a hotel run by the Scottish club. Janet Meldrum, 61, left her job at the four-star Park Hotel, which is next to Rugby Park, after a string of incidents involving Michael Johnston. General Manager, Mrs Meldrum submitted a grievance to her former employers at the end of 2008 detailing incidents of concern. She lodged a second complaint in March 2009 after her resignation. At an employment tribunal in Glasgow before judge June Cape, Mrs Meldrum is claiming constructive dismissal. The hearing was told Mrs Meldrum felt there was a breakdown in trust and confidence and should resign. The club - represented by Mr Johnston - are contesting Mrs Meldrum's claim. The tribunal heard evidence from Mrs Meldrum, of Greens Road, Stevenston, who said Mr Johnston was "nit picking" her work and undermining her. She alleged that when she tried speaking to him on an occasion after being made to feel that she had done something wrong, he waved her away. The ex-manager claimed she felt bullied and harassed by her former employer. The tribunal heard how she asked a man installing a new printer to put the old ones in her office. Mrs Meldrum said then she received an email from Mr Johnston saying she had failed to abide by his instructions. The email sent to Mrs Meldrum said: "I understand you were reluctant to cooperate in the removal of redundant printers. Please do so now." Mrs Meldrum, who described Mr Johnston as being like a headmaster, told the tribunal she responded quickly, telling him she was upset by the allegation and gave an explanation but that she would send the printers. The tribunal was told: "The response was that I need to give a little more thought to my response." She added: "I was starting to feel bullied and harassed. I am a senior member of management and spoken to like a five-year-old." Mrs Meldrum referred to another incident when a new receptionist wanted to check with her before displaying a mannequin wearing a Kilmarnock football top. The tribunal heard the receptionist was informed that Mr Johnston said it did not matter what Mrs Meldrum had to say. She said that after asking him about it in an email she felt "totally undermined". She said: "Anything he was going to do, nobody was to question it." The hearing was also told Mr Johnston wanted to recruit an external company to provide training that Mrs Meldrum planned to do within her own staff. She said he suggested that the company he knew could come in and do training but was not able to give her an answer when she asked what kind of training. Mrs Meldrum said added: "He left me feeling useless. An absolute nothing. He was bullying his way through everything that I was doing. I have never been treated like this in anywhere I have worked." The tribunal was told Mrs Meldrum worked her last day on November 14, 2008 before going on sick leave and subsequently resigning.